Here’s a recent picture of me at the Guitar Center in Manchester, Connecticut. After 15 years of NOT singing, playing or even listening to any music, I followed my brother, William in to the store to watch him buy guitar strings. I LOVE it in there! You see I used to play stand-up bass for The New Christy MInstrels. 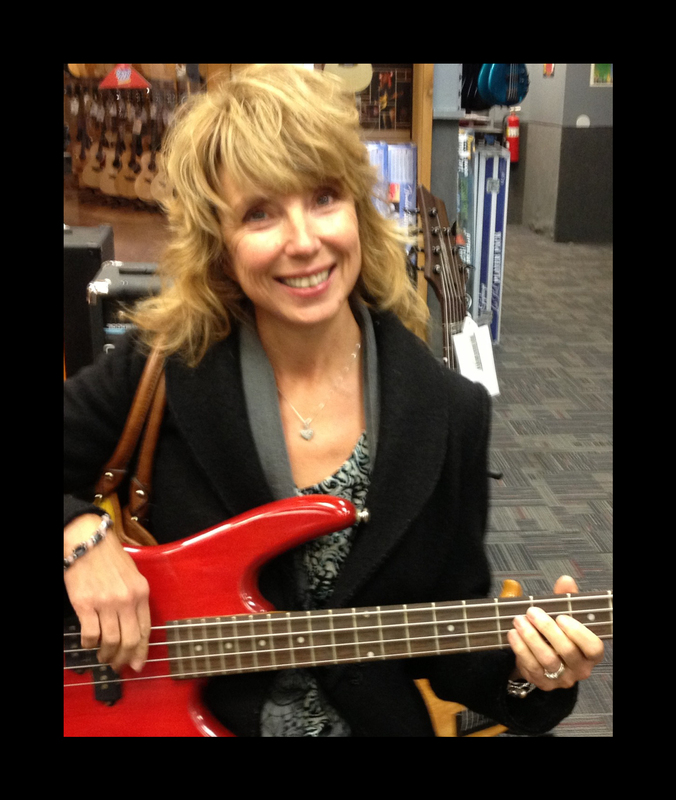 I was their first female bass player (My big claim to fame).But I really had forgotten how to play. With our father’s help, we bought the DD (double dinette) 22 foot Coachman motor home. We pulled out one of the dinettes and replaced it with our electric Baldwin piano. William is 5 years older than me, and at ages 19 and 24 we embarked to play music and see the country. Our parents assumed William would keep a sharp eye on me. Well, I think HE needed more monitoring than me. One time when we were in Nashville for the purpose of pitching William’s songs to whoever he could, we watched a husband and wife play they’re act at our campground. They were REALLY good, and they should have been; we were in Nashville. What mesmerized me was the woman was playing a beautiful stand-up bass. I remember saying to William, “I can do that!” We talked about it a lot after that, and when we reached Denver, we found a bass for $200 in the Denver newspaper. It soon became a big part of our act. I am attracted to the bass because I CAN HEAR IT. I didn’t have hearing aids back then, but was definitively straining to hear. “California is the place you outta be, so we loaded up the truck and we moved to Beverly.” I remebered feeling just like Jed and Granny when we drove up Rodeo drive in our motor home. We didn’t exactly “move” there, but we parked in front of the New Christy Minstrel’s office in Hollywood across from CBS studios and dragged our instruments up the 3 flights of stairs to audition, even though they told us NOT to come. 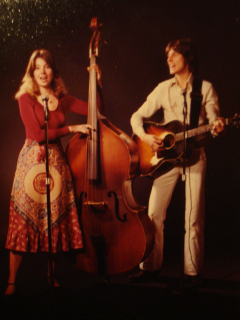 To make this very long story short, which I may elaborate on in future posts, we were then always announced on stage as “William and Nanette Florian, our Brother and sister team from New England.” And so we toured with the New Christy Minstrels. Back at the guitar center, with only a cochlear processor to now hear through,(I am now completely deaf) William grabs this beautiful cherry colored electric bass and puts it on my lap. He clicked my picture and something clicked in ME that this was going to be my new guitar. It felt good. Hurray for me, I’m practicing like a banshee! I bought a case and am flying to Florida with it in 2 weeks to practice with William. He thinks I’m going to join his show when he performs in New England. That MAY be, and that MAY NOT be. Remember, I can only hear what the cochlear processor allows me to hear and I can’t hear pitch changes. I have learned the whole show, and goofing around is fine, but what if something changes on stage and I’m not hearing what’s going on? We’ll see. I’ll let you know! Hey Nan! I love the blog! You're a great writer! I'm looking forward to seeing you In Florida March 7. By the way, dad didnt help us buy the motorhome. I sold my Datsun pick up truck and used the cash for the down payment. The new Motorhome only cost us around $11,000. Hey Nan! I love the blog! You're a great writer! I'm looking forward to seeing you In Florida March 7. By the way, dad didnt help us buy the motorhome. I sold my Datsun pick up truck and used the cash for the down payment. The new Motorhome only cost us around $11,000. Hi, Nan! I was interested to see your site, sorry to learn about your hearing, and inspired by your story. I remember your beautiful voice- from All-State auditions, to "World Without Love", and, of course, "I Feel So Raunchy"(!) from "110 In The Shade"! I want to wish you all the best in whatever you choose to do. Hi Nan, I remember you guys way back when you played at the Ground Round in Falmouth, MA. I was one of your groupies. I remember bringing your single around to the Boston radio stations. Great to read about your life now. Good luck to you! go figure i would have never guested you where that talented loved your voice and life story kept on playing,you have a lot to offer,sincerely paul!